ClaimMaster 2018 is here! First, we’ve changed our software versioning scheme to make version control more intuitive. But most importantly, the new release includes many improvements to the tool, including numerous new features and bug fixes – we’ve improved all aspects of the tool, including user interface, claims/specification proofreading, time-saving tools, and various downloading features, explained in more detail below. ClaimMaster 2018 features a completely re-written and updated graphical user interface that removes obsolete ActiveX controls used for treeviews and tables in ClaimMaster, including a number of other improvements. The older, issue-prone controls have been replaced with new controls that are faster, more stable, and are also 64-bit capable (we plan a release of 64-bit Office compatible ClaimMaster in the next few months). This comprehensive GUI update, which took significant effort, should resolve various crashes after Microsoft Windows and Office security updates that have become more common lately, especially with the recent Office 2016 and Office 365 updates. In addition, our Office Action analysis tool can now handle Office Actions in DOCX format directly, which significantly cuts down on the issues related to OCR quality. b) Major Improvements to Private PAIR Cache. We realize that logging-in to PAIR to retrieve various bibliographic information is quite tedious. If you use a separate docketing system that allows export of bibliographic data in CSV format (e.g., Foundation IP), ClaimMaster can load this bibliographic information into the tool. Once the PAIR cache is loaded, all application bibliographic data will become immediately available for filling out headers in Word shells and various USPTO forms, including IDS forms. c) Retrieval of Assignment Data. ClaimMaster now allows you to download assignment information (in HTML format) either from Public or Private PAIR. To download assignment data for a given application number, select “Collect assignment data for each document” checkbox in Pair Download tool. The new version of ClaimMaster also includes several new download filters, such as “Latest Office Action” and “Latest Claims,” which allow you to pull only the most recent Office Action or pending claims from PAIR. 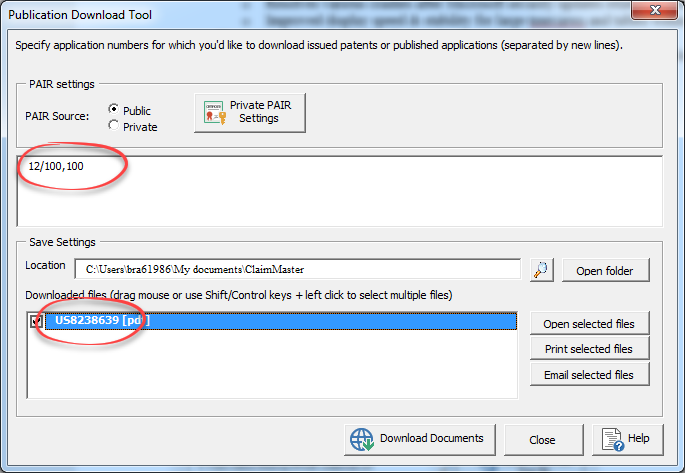 e) Patent Downloading based on Application Number – ClaimMaster now allows you download PDFs of issued patents or publications based on the USPTO application number. ClaimMaster will first use PAIR to resolve the application number to a patent/publication number, and then download the PDF of that document, if it is available. f) Other PAIR Improvements. In addition to the features described above, we have significantly improved the stability of the PAIR crawling tool, especially for Public PAIR, which has been very slow lately. The improvements help both with file wrapper downloading and family tree generation using Public PAIR. a) New Amendment Manipulation Tools – ClaimMaster now lets you quickly accept/reject amended text shown with underline, strike-through, or double-brackets in your documents. Simply select text in the document and then click on “Accept Amendments in the Selected Text” or “Reject Amendments in the Selected Text” features. b) EFS-Web Split-up Tool. We’ve added a feature that lets you split up applications into separate specification/claims/abstract files to streamline the EFS-Web upload process. The tool automatically detects specification, claims, and abstract sections in your Word application and generates 3 separate documents for EFS-Web upload. c) Post-Issuance Proofreading. ClaimMaster now lets you compare the claims in the existing application to the claims in a published patent. This is helpful for proofreading your recently issued patents to make sure that the issued claims correspond to the latest claims you have on record. Another claim comparison improvement allows you to compare the claims in the existing application to the claims in another file. b) Annotated Office Actions. ClaimMaster now generates Office Actions (PDF) with all identified rejections/objections/allowances highlighted directly within the PDF document. The highlights are also visible in the Office Action browser window. a) NPL List. 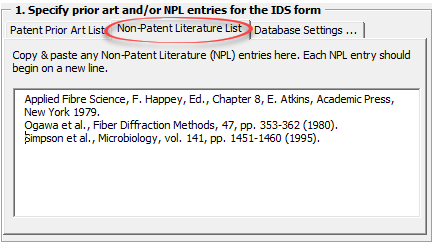 ClaimMaster now lets you specify a list of Non-Patent Literature items directly in the IDS tool, under the “Non-Patent Literature” tab. You can simply cut & paste your list into the text box within the IDS tool and ClaimMaster will fill-in the NPL section of the IDS form with your list. b) Frequently Used Applications. ClaimMaster now lets you fill the headers of IDS forms with bibliographic data specified in the custom CSV file. All pre-loaded items are immediately available for selection in the IDS tool.